I have to say that this is one of the oddest books I’ve read in awhile. 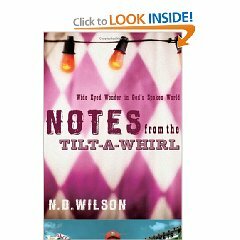 While I think N.D. Wilson had a plan with a coherent story line, Notes From the Tilt-a-Whirl reads more like a ADHD reader’s dream. Just as I start to track where Wilson is making a point he jumps to a related storyline from earlier in the chapter. Then just as it starts to make sense BAM you are back somewhere else. I think he made some good points and had many great stories which brought forth God’s plan for our lives – I can’t recall them. He uses the four seasons and the rotation of the earth as the basis for his points and stories. Many of these stories are from his own life – chasing waves at the beach, trying to work on the roof of a house before the storm hits. I appreciated those but was overall disappointed by the content. This book has gotten some great reviews, but I’m not a fan. If you are up for an interesting ride give it a shot. Adventures and Thoughts of Team Cross is powered by	WordPress 4.3.19 and delivered to you in 1.691 seconds using 38 queries.